What is your cost to serve legal documents to CSC Lawyers? What is your cost to serve CSC Lawyers Incorporating Service with a Summons and Complaint? 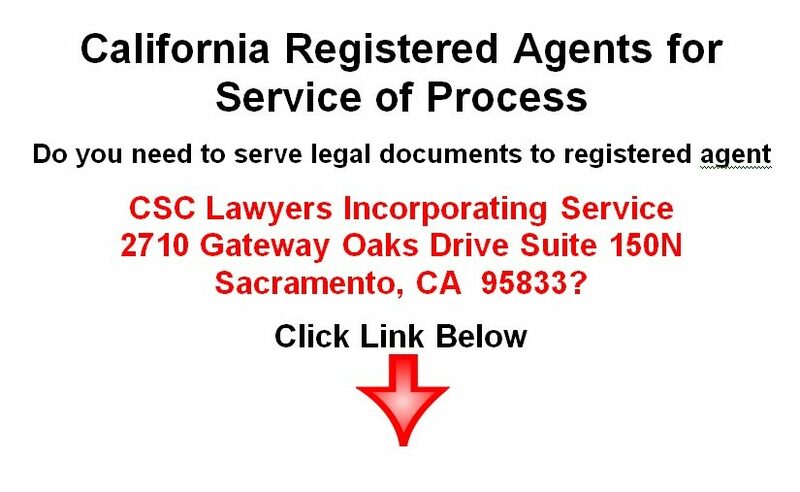 Process Server Lance Casey & Associates states "Sacramento Registered Agent CSC Lawyers Incorporating Service is located at 2710 Gateway Oaks Drive Suite 150N, Sacramento, CA 95833. We serve complaint and summons, deposition subpoenas, civil subpoena duces tecum, notice to consumer, small claims SC-100 plaintiffs claim and order to go to small claims court to Sacramento registered agents for $100." Complete the form below, email your documents to Ljkc916@gmail.com, fax your documents to (916) 244-2636 to serve CSC Lawyers Incorporating Service located at 2710 Gateway Oaks Drive Ste 150N, Sacramento, Ca 95833. Call Lance @ (800) 683-4769 for details. Price starts at $125 & Up for service of process. Items that will appear on the proof of service form. Price includes 20 pages. Pages above this amount is charged at $0.25 per page. Scan and upload your PDF files here. (jpeg files are not accepted). You can also email your files to serviceofprocess916@gmail.com or fax them to 916-244-2636. I will call you and obtain payment over the phone. Prepayment is required.